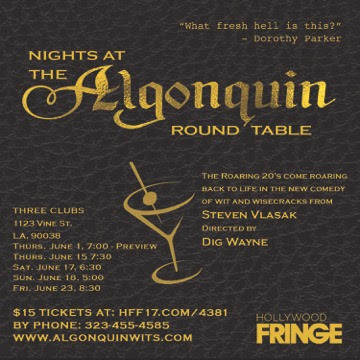 Playwright Steven Vlasak’s Fringe Festival World Premiere play, Nights at the Algonquin Round Table, needs a new title. Its current title is misleading, having the audience thinking they are going to be treated to a non-stop laugh fest. The Round Table was a celebrated group of New York City writers, critics, actors, and wits who gathered daily for lunch at the Algonquin Hotel where they engaged in wisecracks and wordplay. Dorothy Parker, George S. Kaufman, Robert Benchley, Alexander Woollcott and Franklin Pierce Adams were the mainstays of “The Vicious Circle” and are all characters in Vlasak’s long one-act play. But they and their wits are secondary characters here. The main characters are the earnest and budding California writer and wannabe wit Jack Beck (Christopher Tedrow), who is desperate to be accepted as part of the Round Table, and Sally (Erin Jo Harris), the Algonquin waitress who takes pity on the rube. But though charming, the duo and their story is just not that interesting. It is never explained why Beck has a tendency to pass out at inconvenient times. The long drawn out narrative ends in a confusing poker game when Beck bets the family farm and an even more confusing coda the morning after. There are too many scenes in Vlasak’s storytelling and director Dig Wayne’s pacing needs a jolt of electricity. Parker (Roz Stanley) gets off the best one-liners, just like she did in real life.